At 5:50 AM, Woody’s voice awoke me as it echoed through the ship. “Good Morning ladies and gentlemen. It is 5:50am and in 30 minutes we will be crossing the circle”. “The circle” our expedition leader was referring to is that magical ring drawn on atlases and nautical charts of Antarctica and our vessel, the M.V. Ocean Diamond was drawing near. “There may be a slight bump”, he warned and “and of course an Emperor Penguin holding a flag, standing sentinel on an ice flow”. Several circles define Antarctica. 60°S is the geopolitical boundary. The Antarctic Convergence, the meeting of Antarctica and Subantarctic waters, which winds roughly between 50° and 60°S around the globe is the “biological” border. And finally, at 66°33’46.1” S the Antarctic Circle has its own special significance. This line is the northern limit at which the summer sun remains above the horizon constantly for 24 hours or in the winter, below. On December 21st, the Antarctic Circle has 24 hours of sunlight and on June 21st, 24 hours of darkness. It is the frontier of deep Antarctica. And like the seemingly immovable glaciers, the Antarctic Circle is shifting as well. As the earth’s axis gradually moves from its 23.5° tilt, the Antarctic Circle shifts 15m south, per year. When sailors cross the equator for the first time, both now and throughout history an elaborate, but tongue-in-cheek ceremony is held and if all goes well for the uninitiated “pollywogs” they are baptized “shellbacks”. 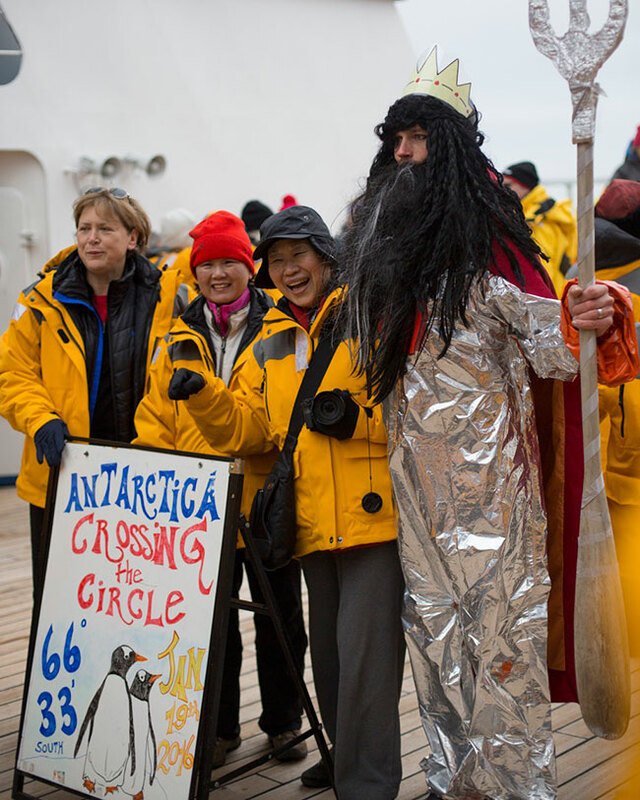 However despite of the difficulty of reaching Antarctica, surprisingly there is no traditional ceremony for crossing its circle. But that didn’t stop us from celebrating. 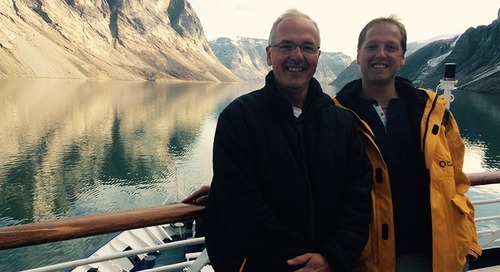 The “Circle Trip” as it is known is one of the key voyages when travelling to Antarctica. Of course any voyage to Antarctica is worth celebrating, but going further south, where ice conditions are far more perilous is a logistical challenge that adds adventure to an expedition. And while I don’t agree, one passenger said to us at the beginning of the trip that for him there was no point of going to Antarctica if you didn’t cross the circle. Either way at 5:52am I grudgingly pulled my bed sheets aside and walked blindly to the bathroom. I’m not a morning person, but I had a key responsibility. I was assigned King Neptune, the Roman god of freshwater and the sea. At 6am the staff grouped together and donned hats and wigs and even face paint. Borrowing traditions from the Equator ceremony, Neptune, would be the master of ceremonies. 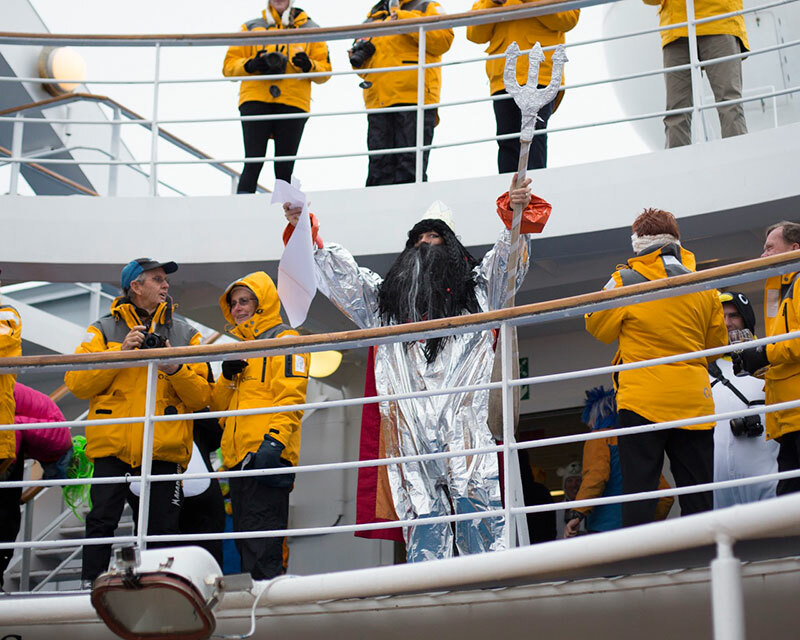 I donned a long black wig and beard, a silver survival suit, a paper crown and of course, a trident. Accompanying Neptune were two mermaids and a hodgepodge of monsters from the icy depths of the Southern Ocean. When the moment arrived we marched out on deck, like extras from “Pirates of the Caribbean”. 189 yellow coats parted as we made our way to the stage in front of the pool. It was cold and grey, which was fitting for such an ominous passing. “All hail for King Neptune!” yelled one of my half-human half-fish entourage. The crowd echoed his words and held out their champagne-filled glasses. Neptune, yours truly, then meandered through a speech asking what these gold-cloaked sailors were seeking beyond the circle and whether they understood both the danger and the responsibility of their crossing. In 2016, Neptune is not only a fearless god, but also a stout conservationist. 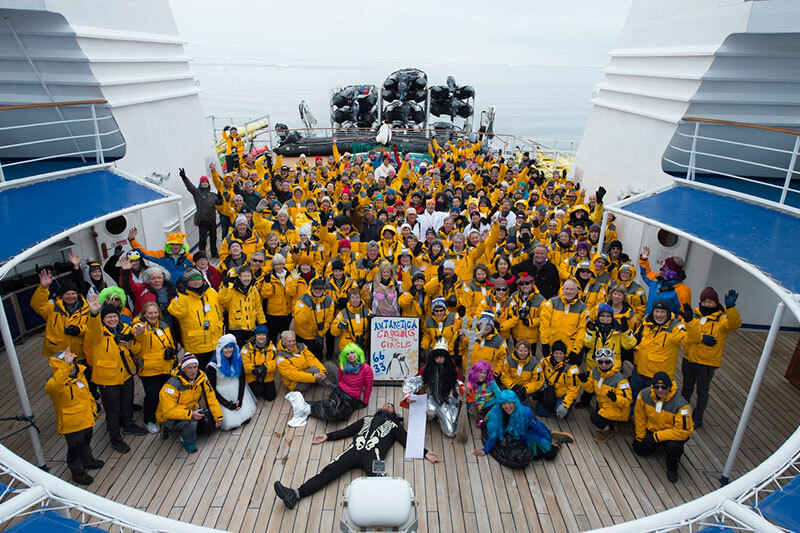 He imperiled these sailors to respect the regulations of IAATO (International Association of Antarctic Tour Operators) and also to share with family and friends what they would learn and see on this continent. 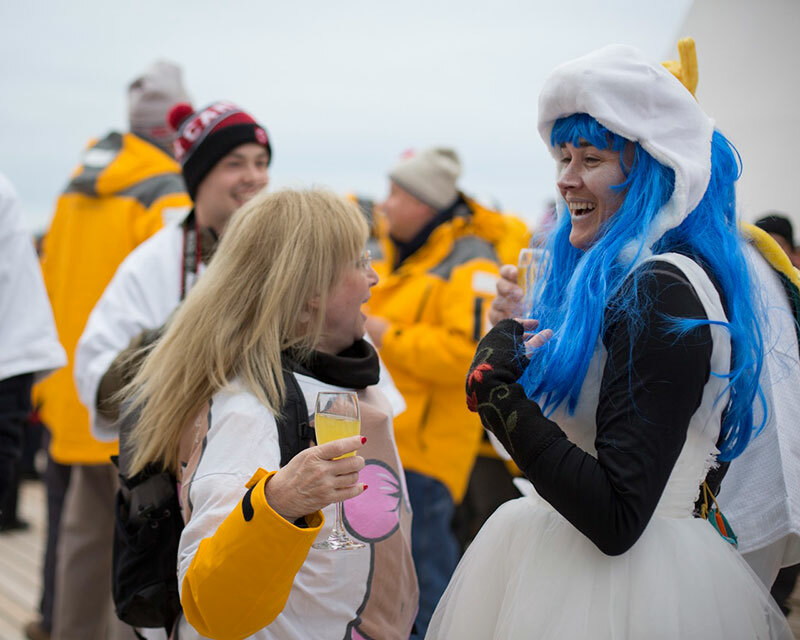 And in spite the humour of the ceremony, there was an understanding from passengers that coming to Antarctica was indeed a privilege. 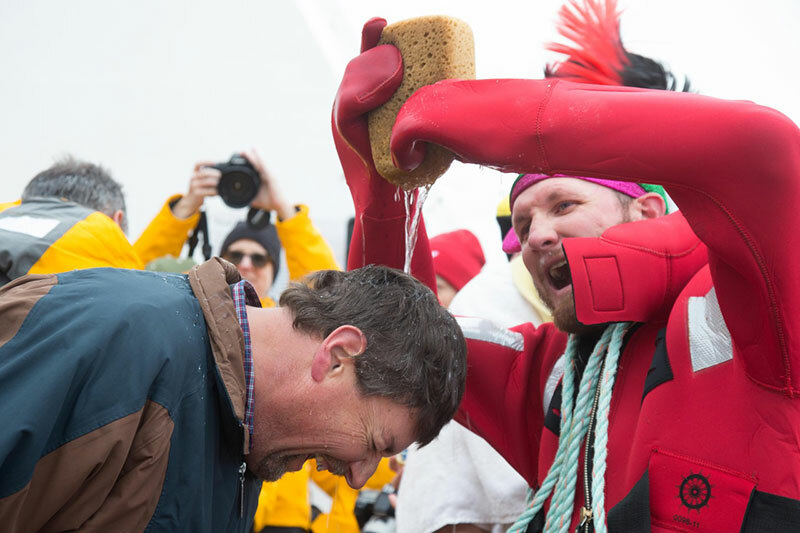 As Neptune’s last words rung out, passengers stepped forward to be formally baptized for crossing the circle; a splash of seawater over the forehead, a turn, and an anchor stamped across their forehead. They were now true sub-66ers. At 66°33’S there was no bump. We waited for it, but it never came. But what did greet us immediately was a sea of ice, scattered puzzle pieces to the horizon. It seems that while the Antarctic Circle is a human notion it translated into the material reality of frozen sea. We were the first to cross the circle this season, but Neptune and more importantly Antarctica would decide how far we would go. 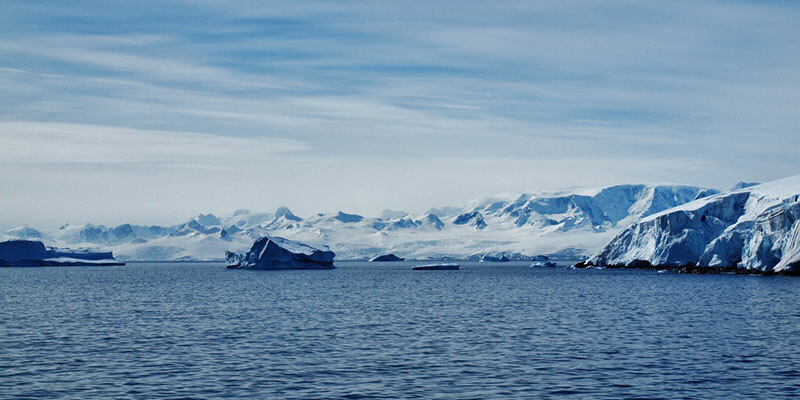 Venture on our Crossing the Circle: Southern Expedition expedition this coming Antarctic Season, learn more about the voyage here.